SEMINOLE, Fla. - Feb. 6, 2018 - PRLog -- At 15, Sonja (nee Schoontje Pagrach) was taken by the Nazis from her home in the Netherlands to a series of concentration camps throughout Nazi Europe, including Auschwitz, the most notorious of all them all. "I did the tour," she used to say with sarcasm. Sonja faced death in the gas chambers three times and survived. At 18, John, born in the former Dutch East Indies, (now Indonesia), was drafted into the Dutch Navy Air Force. While still in boot camp, he was captured by the Japanese to become a prisoner of war. He was working as a slave laborer in Nagasaki when the Americans dropped the atomic bomb there. He, too, survived. After the war, Sonja moved to Amsterdam and John immigrated to Montreal, Canada. Both longing to find everlasting love, they were eventually introduced by correspondence through a mutual friend. They fell in love through writing letters and exchanging photos. When they finally met face to face, they knew there was no turning back, they were meant to be together for the rest of their lives. Following Sonja's passing, after an inspiring and courageous 21-year battle with cancer, their daughter Roslyn found all of her parents' love letters. "I found 133 letters, over 250 pages, all hand-written in Dutch. The letters are beautiful and filled with romance," says Roslyn. Roslyn interviewed her parents to know the details of their whole life story. 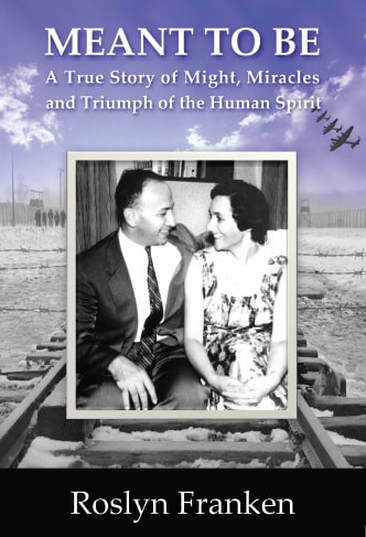 In an effort to share with the world their incredible saga of survival over suffering, love over loss, and triumph over tragedy, Roslyn put her parents' love story to the page in a book she wrote entitled, Meant to Be: A True Story of Might, Miracles and Triumph of the Human Spirit. In her book she includes several excerpts from her parents' love letters. To further share their story, Roslyn took her parents' story from the page to the stage with a multimedia presentation she delivers to diverse audiences including faith-based groups, schools, community organizations, Holocaust remembrance and education groups, cancer groups, corporations, and more. In her book and presentation, Roslyn also shares how when diagnosed with cancer at 29, she turned to her parents' never give up attitude in her fight to beat cancer and become a long-term survivor. Roslyn is now taking Meant to Be from the stage to the screen with a feature film adaptation of her book that is currently in development through Five Star Studios Inc.
Roslyn is a regular media guest on television, radio and in print including NBC Daytime and ABC Action News television, CJAD Radio, The Montreal Gazette, Canadian Jewish News, Tampa Bay Magazine and many more. See www.roslynfranken.com/in-the-media.html. www.RoslynFranken.com, call 613-843-0155, or send email to info@roslynfranken.com.